For those of you out there that follow Bauer-Power fairly regularly, you know that I'm a personal fan of the Acorns investing app. I use it in conjunction with the Dave Ramsey "baby steps" and I think it's the easiest way to save money. Period! 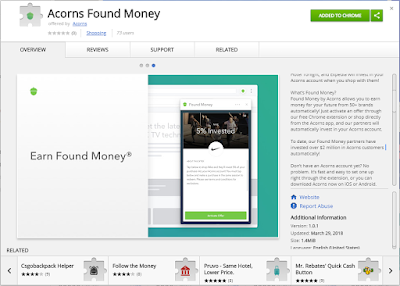 I've also mentioned in the past their "Found Money" feature. Basically, if you shop at certain online retailers (Like you would be doing anyway) a small percentage of your purchase gets re-invested in your Acorns account! It's pretty awesome if you ask me! Found Money by Acorns allows you to earn money for your future from 50+ brands automatically! Just activate an offer through our free Chrome extension or shop directly from the Acorns app, and our partners will automatically invest in your Acorns account. To date, our Found Money partners have invested over $2 million in Acorns customers automatically! Once the extension is installed, you just need to make sure you are logged into your Acorns account when you shop at the authorized online stores. That's it! Simple! Are you an Acorns user? Let us know what you think about this in the comments!